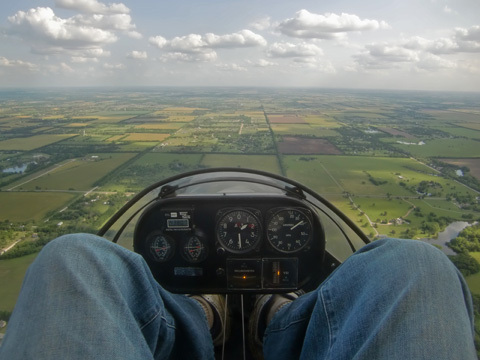 It was another Sunny Sunday as I took off to commune with the clouds. Prior to takeoff I wasn’t really sure which way to go. I had thought about heading up to High Point to see Doug and Sabrina Moler but a call to Doug informed me that he would be working. “Working” in this case was to fly the Westwind corporate jet he pilots for a client. 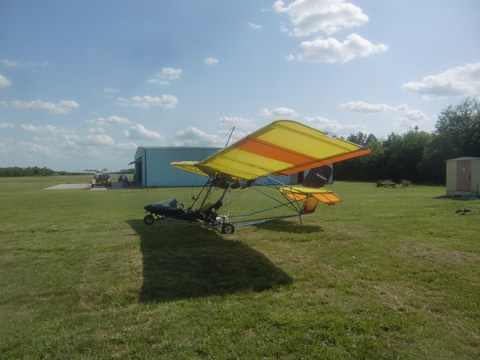 So, I decided to make a grand swing NNE to Benton Airpark and then over to The Gliderport. 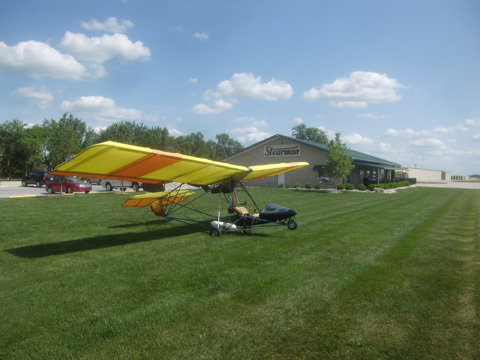 Over the years I have hangared my plane at both fields but now I am settled in at the Selby Aerodrome south of Haysville, Kansas. My favorite looking sky, whether stuck on the ground or soaring above it, is dark blue, partly cloudy with fluffy cumulus clouds. That it was, this day. 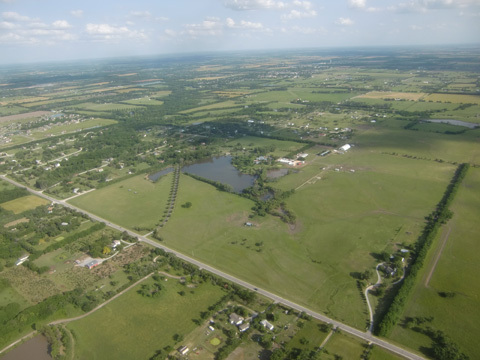 I headed East to circumvent Derby, Kansas to then swing North up to Benton. Anyway, I saw a herd of goats below. You don’t see goats too often in Kansas and I have an affinity for them. I often thought I would like to have a few as pets. My enthusiasm for this endeavor, though, has been tempered by my friend Gary Foster (a farmer) explaining that goats will climb all over everything – including your car! The thought of goat hooves scratching up my car has slowed me down on this idea. Since the goats are so small in the shot you will just have to take my word that is what they are. 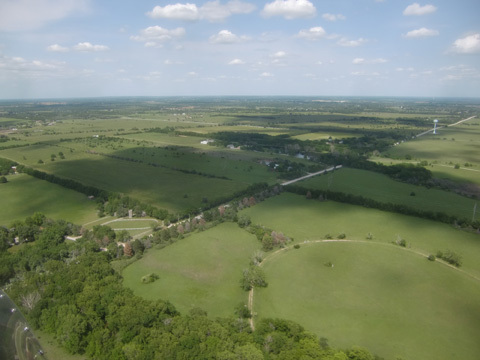 The neatest part of the scene was that a couple of dogs had rushed out at the same time I was flying over and were in the process of herding the goats around the field. No human seemed to be in attendance but the herd dogs just liked keeping the goats in order. 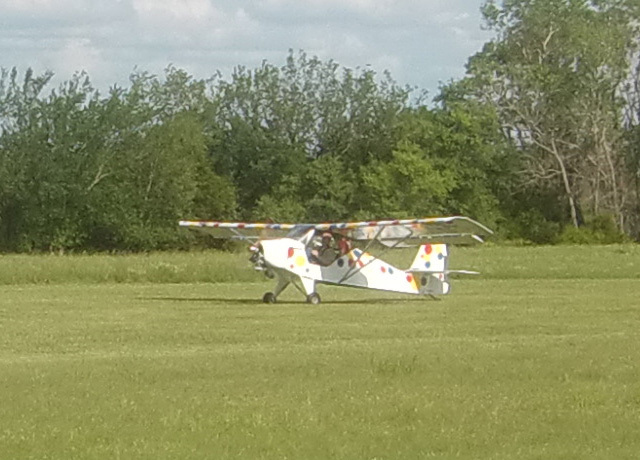 After about 45 minutes I arrived at the Benton Airpark. 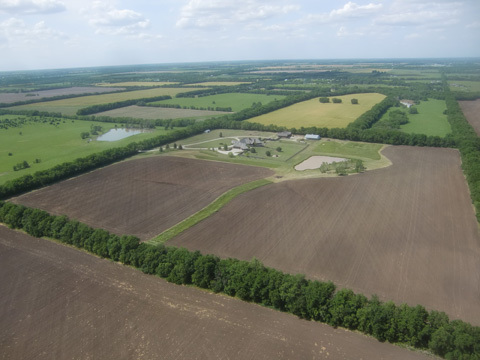 Sometimes I take aerial photos of the field before landing but this time I didn’t because I was continually scanning for traffic and didn’t want to miss any. Benton has the nicest grass apron around. I got out of my plane and wandered over to see a couple of interesting craft sitting on the concrete. 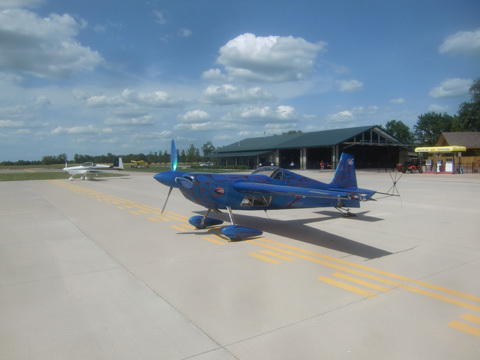 I think the aerobatic plane shown below might be an Extra. There were a few people lounging in the restaurant which is in “open air” mode now with the great weather we are having. My wife and I have eaten there a few times. It is a good place to stop in. I hopped back into my MXL and it started with one pull of the rope – YES! 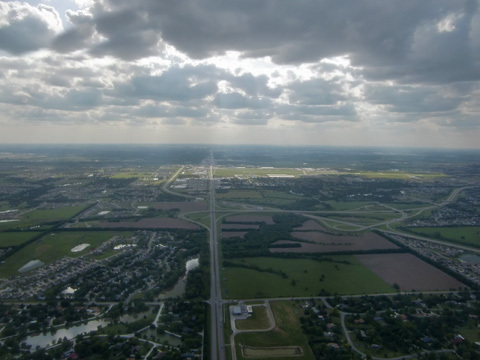 I headed over to the Gliderport – AKA Wichita Airpark. 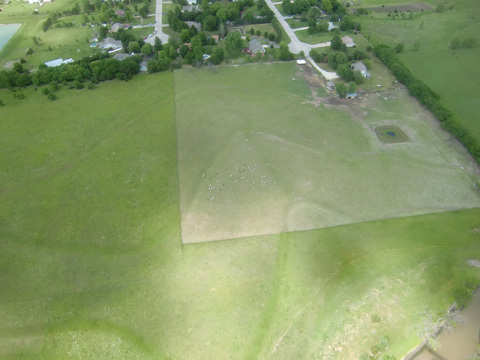 Again, when entering the Gliderport airspace I dispensed with the desire to get an aerial of the field for you to see. Since it is called “The Gliderport” and because the sky was filled with the harbingers of good soaring (cumulus clouds), I fully expected the pattern to be occupied by one or more sailplanes. As it happened this was not the case. There were a few guys scheduled to come out later in the afternoon, though. As I looked around the field I saw my good buddy Doug Bryant and his dog. 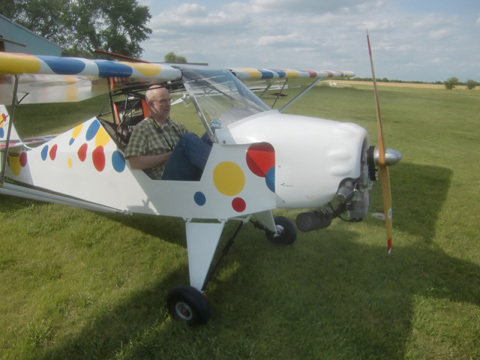 Doug was featured in my latest movie on ultralights, UFM2. He told me he is getting a lot of hours in the Mosquito and very happy to have switched over to a Rotax 503 as its powerplant. I wish I had a better shot of him above but my pocket cam is beginning to show signs of disintegration. I have owned 4 of these things and they all start malfunctioning after about 2 years. This one is losing its ability to focus properly. Anyway, you have a pretty good approximation of the scene in the photo above. Suddenly, out of nowhere, appears our buddy Gerry Sibley. Gerry was out “plane watching” expecting to see some sailplane action. When he is out “plane flying“, he takes up his CONSOLIDATED VULTEE BT-13A. 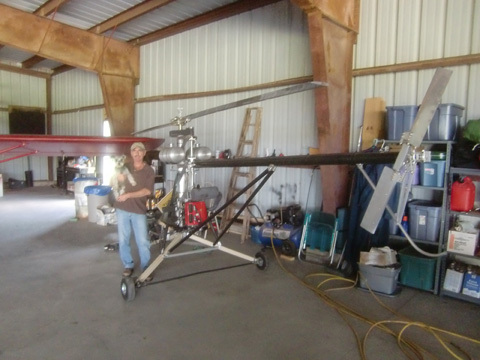 It is quite a machine and Gerry takes it to a lot of the flying events in the area. Today, though, he was without wings. After hanging out for a few minutes James wanted to get airborne again. He asked any of us to prop the Belite. One thing I don’t do is prop airplanes. I just don’t like the idea of losing a “guitar playing” finger. Yeah, I know everyone says it’s safe – I just don’t want to do it. So, Gary volunteered to start the Belite. Bein’s how it is a 2-stroke motor, though, the process was not working. James also has a pull start under the cowling so I volunteered to start it that way. One pull and it was running. 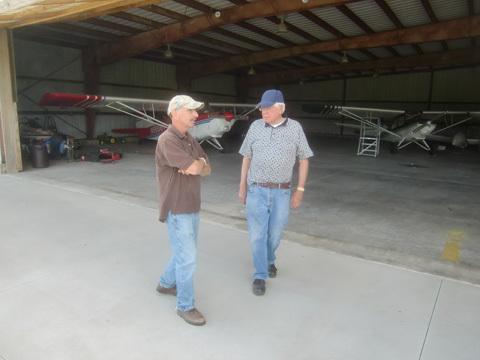 I also had the opportunity to meet with The Great Charlie Pate – Sailplane Mavin. 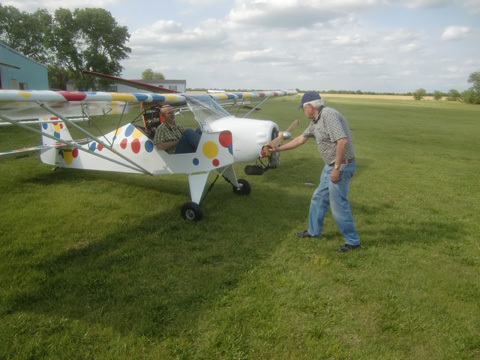 Charlie stopped for a minute to chat right before his sailplane guys showed up for tows to altitude. Seeing James grab some air reminded me that we were on the downside of the afternoon and it was time to head back to my hangar. I popped into the air. As I passed over them I waved goodbye to the sailplane guys and headed South East. I should have taken the picture above a little earlier but when I finally thought about it I figured “later is better than never”. If you know where to look, the Gliderport is in the upper middle of the shot. If you REALLY look closely, you will see Wiebe climbing out in his Belite. Another great thing about partly cloudy days with big cumulus clouds is the shafts of light you will see. 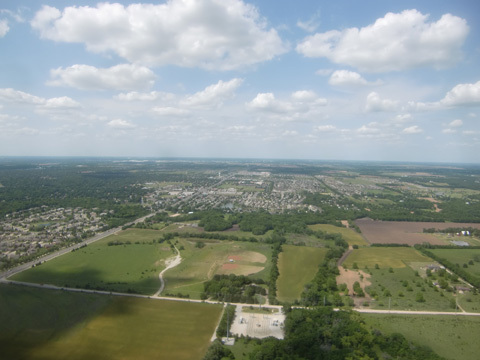 The scene above is looking West toward Beech Field. Right after taking the shot of Beech Field I took the one above. Here we see many of the elements I find entrancing when flying over Kansas on a day such as this. First, the beautiful shades of green that carpet the earth. Second, my favorite sky-type filled with beautiful clouds. Third, the aforementioned “Shafts of Light” which are a sign from God that He is pleased with His Creation. On top of all this was the pleasant air temperature and lift from the air currents that allowed me to actually gain altitude with and engine RPM of only 4350. Earlier I mentioned Wiebe’s Instruments. Note in this shot the new Belite Instruments I just installed. They are the ones with the LEDs that stand out so well. The one on the left is an Inclinometer and the one on the right is a VSI (Vertical Speed Indicator). Both are working great. 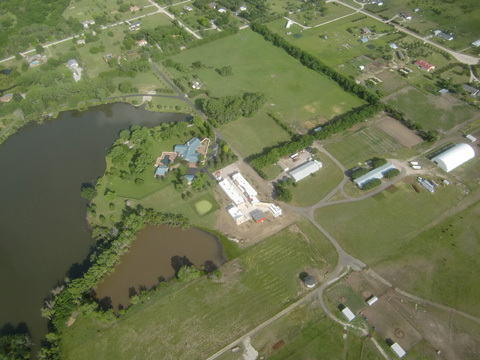 Above you see a very intricate garden next to a home in the country East of Wichita, Kansas. 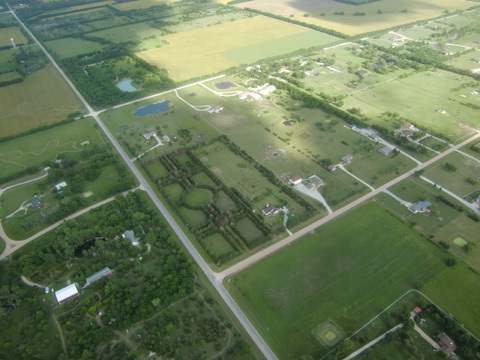 As I continued, I spied Wink Hartman’s estate in the distance. Wink is an Oilman and aspiring politician. He keeps some novel animals on this ranch. Today I saw some longhorn steers. The shot above was taken to give you a mental image of what I did next in the trip. 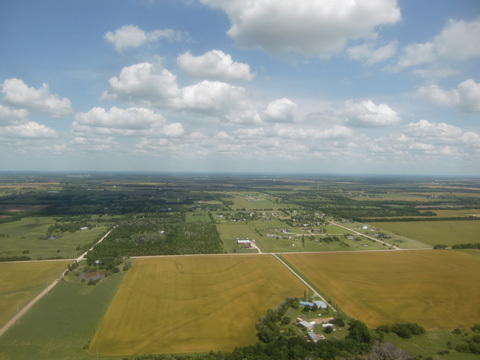 Having spent most of the flight at altitudes of 600 to 1500 feet above the ground, I saw one of my favorite things just east of Derby, Kansas – a large, green wheat field. 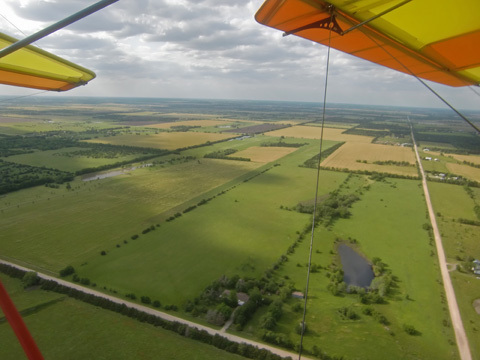 I like to drop down over a field like this and glide about 6 feet above it. It is breathtakingly beautiful. I was having too much fun bobbing and weaving above this masterpiece that I didn’t have time to take a picture. 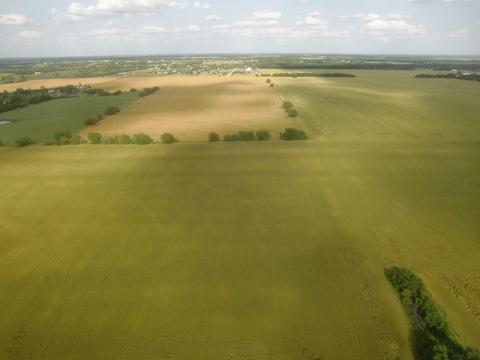 (I took one of another field at that altitude in “3 Hours on a Sunday“, recently though) This field is just beginning to make the changes signalling harvest time and I expect the next time I pass over it its coloration will have “browned up” significantly. When I got back to my hangar I was surprised at the sight above. Earlier in the afternoon when I left on my flight there were two Kolbs parked in that space – both with their wings off in “storage” mode. Upon returning I now see the yellow one assembled and presumably ready to fly. The other one has left the hangar. 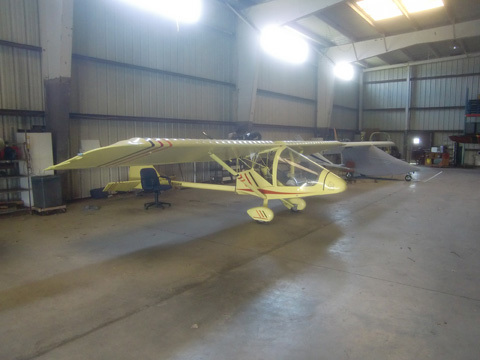 Both planes had been in the hangar since winter. I have yet to meet the owner but I hope to soon. 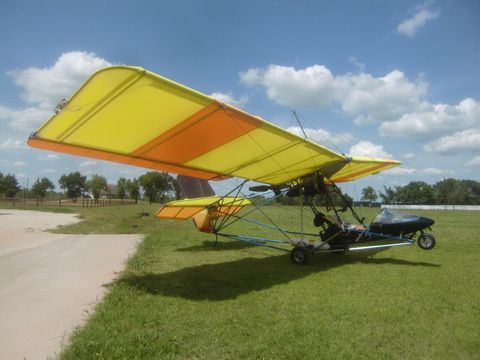 It looks like we have a new member joining the “Fun Flying Fellowship” we have here in Wichita! Norman Rockwell! That makes my day. See you soon Bob.